The Drakensberg mountains of South Africa is a 200-kilometre-long mountainous wonderland and world heritage site.It is the highest mountain range in Southern Africa.It is also know as “uKhahlamba” or“The Barrier of Spears”. The Dutch Voortrekkers named it as 'The Dragon Mountain'. It forms a natural border between Lesotho and KwaZulu Natal.The largest proportion of the Drakensberg area falls in the province of KwaZulu-Natal. The Drakensberg Range has three sections,South, Central and North.The Northern Drakensberg comprises Royal Natal National Park,Rugged Glen Nature Reserve,Amphitheatre,Mont-aux-Sources, Ifidi, Mnweni & Ntonjelana valleys, Singati Valley, the Mnweni cutback, Mponjwane, and the Saddle.The Central Drakensberg or Berg comprises of Mlambonja Wilderness Area, Cathedral Peak,Organ Pipes, Ndedema Gorge,Ndumeni, Mdedelelo Wilderness Area, Monk’s Cowl, Champagne Castle,Cathkin Peak,Injasuti, and Giant’s Castle Game Reserve.Southern Drakensberg has Mkhomazi Wilderness Area,Loteni,Kamberg,Vergelegen,Hinghmoor,Sani Pass,Mzimkhulwana Nature Reserve, Mzimkhulu Wilderness Area, Garden Castle, Rhino, Giant’s Cup Hiking Trail, Bushman’s Nek, Sehlabathebe National Park, Thomathu, Devil’s Knuckles, and Ramatseliso's Nek. The mountains are capped by a layer of basalt approximately 1,400 m thick, with sandstone resulting in a combination of steep-sided blocks.The Drakensberg Mountains, with their awe-inspiring basalt cliffs, snowcapped in winter, lush yellowwood forests and cascading waterfalls, form a massive barrier separating KwaZulu-Natal from the Kingdom of Lesotho. This 243,000 hectare mountainous region known the uKhahlamba-Drakensberg Park has been preserved and venerated for eons since the San people or bushmen roamed these slopes.This is one of South Africa`s best hiking spots, with varied environments and awesome views. 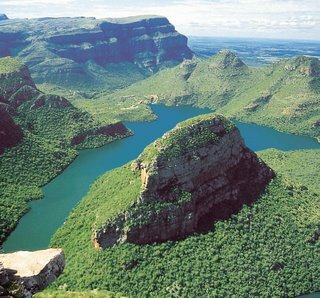 It is an important region for adventure activities like mountaineering, camping, bird watching, river crossing, trout fishing, and many more such activities.The entire Drakensberg is riddled with incredible waterfalls, rock pools, mountain streams, crisp mountain air, caves and special spaces that draw both visitors to South Africa and locals alike. Cave and cave paintings :- In Drakensberg of KwaZulu Natal lies Ukhahlamba-Drakensberg Park which is a world heritage site , it also has over 600 examples of rock paintings in caves around the park. The Drakensberg has between 35000 and 40000 works of bushman art and is the largest collection of such work in the world. The oldest painting on a rock shelter wall in the Drakensberg dates back about 2400 years", "paint chips at least a thousand years older have also been found.It is famous for its outstanding both in quality and diversity of subject. Drakensberg range is a major tourist destination in South Africa and one of the best-known adventure destinations in the world. 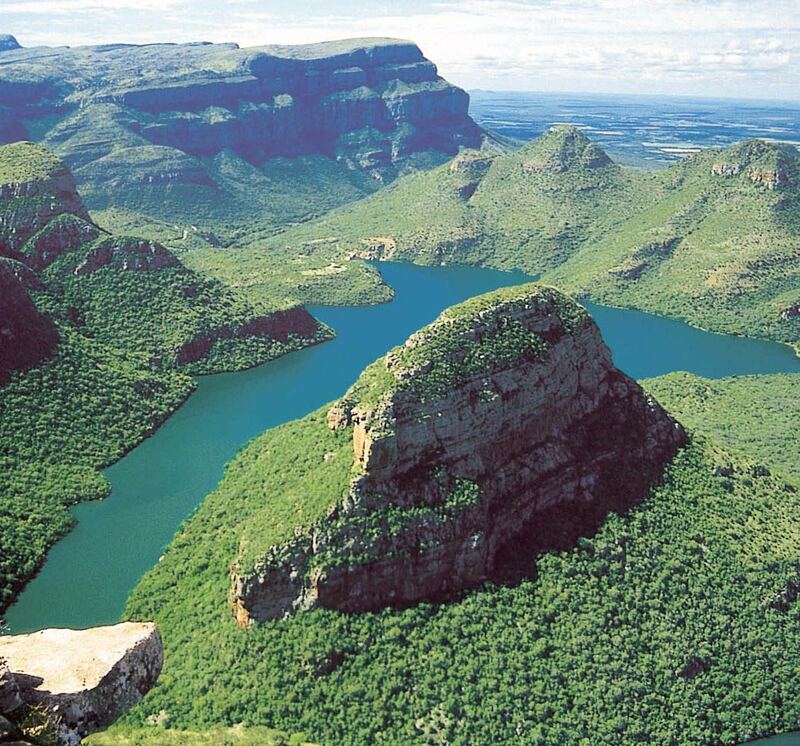 Mont-aux-Sources :-It is regarded as the one of the highest portions of the Drakensberg Mountain range. Mont-aux-Sources is regularly described as a mountain block. The amphitheatre, of which Mont-aux-Sources is part, is a five kilometre wall of rock that is at once intimidating and awesome, and forms part of the Royal Natal National Park.It is surrounded by mountain peaks and visitors can enjoy hiking. 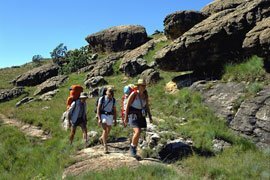 Cathedral Peak :- It is surrounded by most spectacular mountain scenery.The peak is bordered by two wilderness areas the Mdedeleo and Mlambonja.It is a retreat for nature lovers, mountain bikers and rock climbers. Giant’s Castle :- It lies at the southern end of the Drakensberg.It get its name from the outline of the peaks and escarpment that combine to resemble the profile of a sleeping giant.There are a number of hikes to choose from and they range from the rather severe hike to Bannerman Hut, to the more sedate Champagne Pools circular walk from Giant’s Castle main gate, which takes you to secluded pools for swimming and fishing.